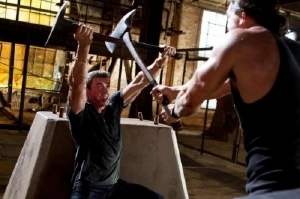 Here's the first trailer for Walter Hill's revenge flick, Bullet to the Head starring Sylvester Stallone. Jason Momoa co-stars along with Christian Slater, Sarah Shahi, and Sung Kang. Bullet to the Head sees a wide release February 1st, 2013. Best week of the year, Arnold and Sly new movie trailers, and the two at Expendables 2 tonight! Wow, Walter Hill. He hasn't directed anything in awhile. My favorite of his was Streets of Fire. The in-car comedy seems completely out of place in this trailer. I hope it's a bit more cohesive in the film. Also: IFC just released BULLET IN THE FACE, why no love?